Last week, Mattel announced that Barbie is getting a makeover. A whole bunch of them, in fact. As last week, 33 new Barbie dolls are available for purchase through the website, in three new body types — petite, tall, and curvy — and seven skin tones, 22 eye colors, and 14 "face sculpts." We rounded up some sharp thoughts on this news, ranging from what this means for Mattel&apos;s bottom line to whether an widely hyped debut of Barbie&apos;s new looks is really a step forward. Mattel&apos;s expansion of Barbie&apos;s look...represents the basic, hopeful idea that diversity is valuable not just for diversity&apos;s sake (or, as Anna Holmes recently put it, as a kind of grudging obligation). Diversity is—much more pragmatically, much more transformatively — good business. If consumers can see themselves in their dolls, Mattel has calculated, they will be more likely to purchase those dolls. Although the original waifish, blonde hair blue-eyed Barbie reigned supreme on toy store shelves, I only had black Barbies. This was very important to my mother, so important that if a store didn&apos;t have any black Barbies she would drive to another that did. She never explained why — and I never asked — but as an adult I understand that she knew it was crucial for me, a black girl coming of age in the 90s, to own dolls that looked like me. I am thankful she was proactive in making sure I saw myself reflected in the dolls I played with. Because whether people want to admit it or not, toys do shape how children view themselves. Over at Jezebel, Kelly Faircloth brings up an interesting point: what if giving a curvy Barbie to a chubby child ends up doing more harm than good? It&apos;s unquestionably positive for girls to see a wider array of skin colors and body types represented positively. A more diverse Barbie is a good thing. But it&apos;s impossible to separate my personal response to this development from the fact that I was a Barbie-loving chubby child, and — as Time alludes to — my reaction to being singled out with a gift of the "curvy" Barbie might very well have been absolute devastation. 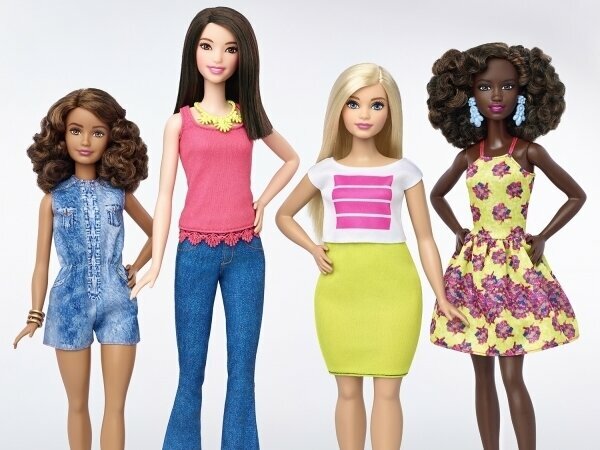 Following Eliana Docketerman&apos;s exclusive interview with Mattel in Time on the new Barbies, Jill Filipovic, also at Time, steps back to ask a bigger picture question — whether the dolls are skinny or curvy, white or brown, are we really okay with what the Barbie brand represents? One pointy-toed step forward, though, is hardly a giant leap for womankind. Barbie is a literally objectified woman, not a superhero or an action figure but a plastic lady notable because she&apos;s pretty. And she remains a quintessential &apos;girls&apos; toy,&apos; Patient Zero in the pinkification pandemic that has infected toy stores for two generations and now prominently segregates &apos;girls&apos; toys&apos; (Dolls, Arts & Crafts and Bath, Beauty & Accessories on ToysRUs.com, for example) from &apos;boys&apos; toys&apos; (Action Figures, Video Games, Bikes & Ride-ons). But unlike Barbie&apos;s new range, unveiled with an exclusive in TIME magazine and more press embargoes than Barbie has convertibles, Lego&apos;s latest character was simply placed in the middle of a busy park scene, sitting in his wheelchair as if it were the most natural thing in the world. As other companies make grand, sweeping gestures towards their commitment to diversity, it&apos;s this that might just be the biggest step forwards.